The tacos al pastor at El Trompo. 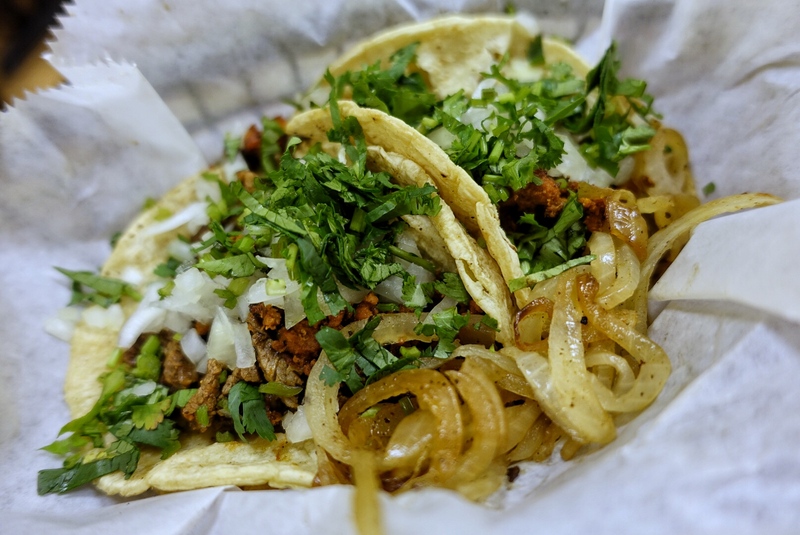 El Trompo in Alpharetta holds its own as an excellent taqueria beyond the usual taco hangouts in Smyrna, Tucker, and Buford Highway. The restaurant serves many specialties from Mexico City such as tacos al pastor, aka slow-cooked marinated pork, and campechano, a mix of meats such as griddled steak and pork. It’s is hard to find tacos al pastor done well in Atlanta, and especially hard to find al pastor cooked on a trompo, a spinning top that resembles a gyro spit and cooks the red pork and pineapple. Good tacos al pastor are worthy of a last meal. The woman manning the register when I visited assured me that El Trompo indeed has a trompo in the back; and, while I didn’t see it, the al pastor certainly tasted like the real deal. Too often, taquerias expertly marinate and cook the pork, but then undo all that work by carving it up into oversized chunks instead of thin slices. 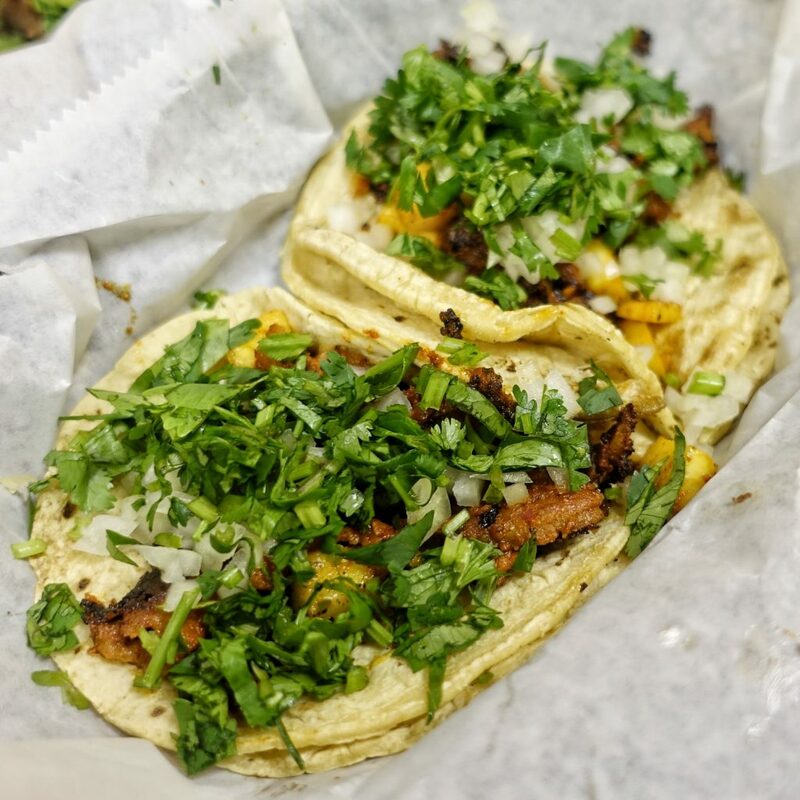 El Trompo does their al pastor pork justice by shaving it into crispy, tender slivers. Cilantro, chopped raw white onion, and roasted pineapple balance the richness of the tangy meat. Give it a squeeze of lime and add creamy green salsa, and you won’t be able to eat just one. As for the campechano, seasoned beef and pork combined with chopped raw white onions and cilantro made for one well-balanced taco. But skip the barbacoa tacos—while the meat was tender, it wasn’t seasoned well, and not even the sweet caramelized onions and some excellent red salsa could help. While I wish El Trompo made its own tortillas, I recognized the tell-tale freshly ground corn flavor of El Milagro, my preferred tortilla at home. The restaurant doubles up on the tortillas on each taco, so go ahead and make yourself a second bonus taco with all of the bits the fall from the first. Moe’s Southwest Grill is completely reinventing itself. Will diners bite?